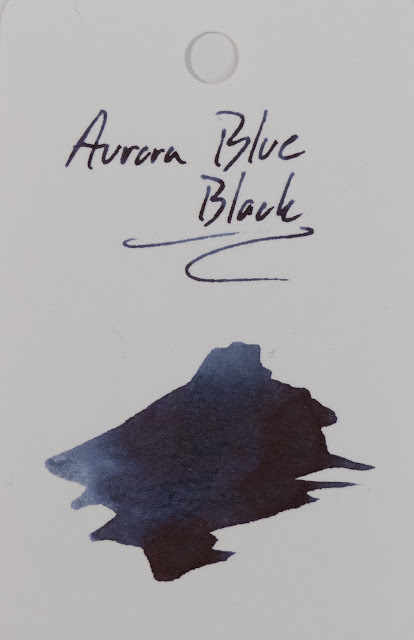 Aurora Blue Black Ink ** And A Give-Away! ** | Inkdependence! This is the new ink from Aurora's line, and I'm glad to bring it to you so close after its release. It's been out for 2 or 3 weeks, I think, and I've used it in a variety of pens. It's a little bit of a mixed bag. I really like the color of this ink. It's a great blue black. Just the right balance of blue and black, if you ask me. It also works really well on copy paper. No feathering or spreading, and just a few dots showing through. Excellent performance on this kind of paper from some really wet nibs. On the other hand, it's a little bit too dry for me. I'm pretty sure that I have some pens which could benefit from a dry ink, but it doesn't really like my Pelikan m800, and that's a pretty wet pen. It works about as well in my Sailor HB nib as in that Pelikan's fine nib. The Pelikan actually feels a little rough with this ink. Kind of like a pencil. It's consistent, but I prefer a wetter ink with a smoother nib-feel (if you know what I mean). Like I said, it's a mixed bag. I can't give it a whole-hearted endorsement, but it's got some great qualities. Check out the images below, and let me know what you think. This is really good performance on the copy paper. This ink is in some really wet nibs, and it's not going crazy in any of them. You can see some of the sheen in the photo above, as I took it at a slightly different angle to the others. This is the new Col-o-Ring ink testing books made and sold by Well-appointed Desk. You can see my review of these cards here. These are the ones that I had inked up. There are lots more of them at the end of the post. 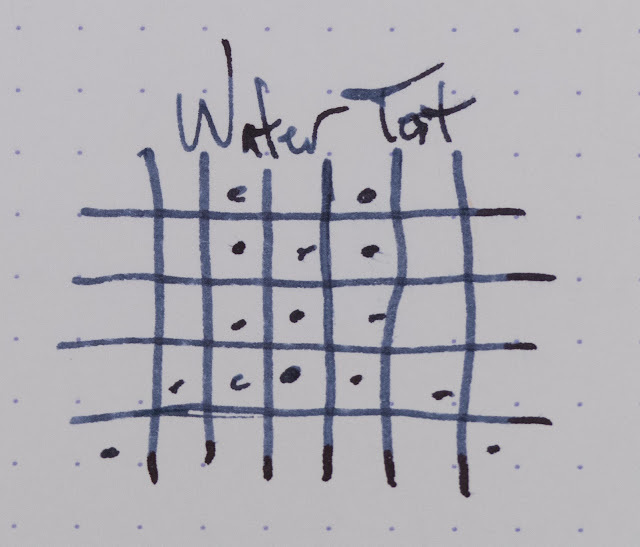 You can also look through lots of blue/black inks using the AndersonPens Ink Tool. The turquoise and the red splotches here came from the other side of the paper towel I used to blot away the water. I'm a professional. That's what that is. Professionalism. To get yourself a free bottle of this ink, mailed anywhere in the USA (no international shipping), use the Rafflecopter above to enter. The give-away will run until 12am on April 2nd, and I'll contact the winner. They'll have 24 hours to send me their contact info, or I'll have to pick another winner. Does the amount of blue that shows through vary on the pen that you use, or does it seem to be fairly consistent? 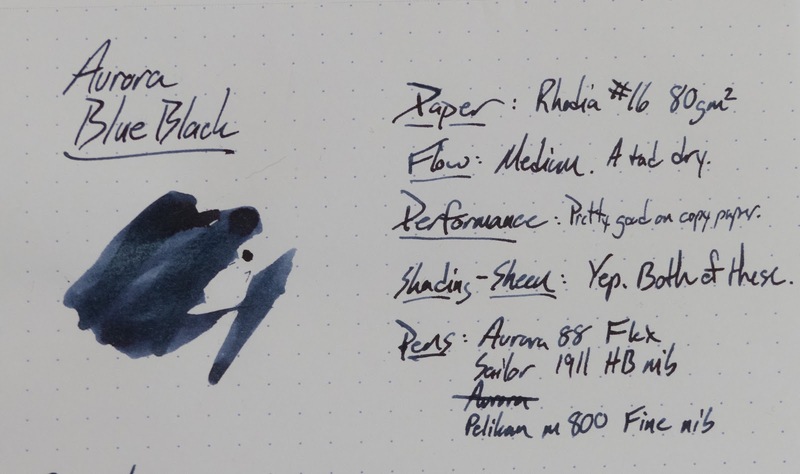 I love blue-black inks. My favorites are ESSRI and Sailor Sei-Boku. I appreciate the fastness to water and light. I love this Blue Black ink! I have KWZ Standard Blue Black which is also gorgeous, but is more black than blue, but in a wider nib the blue shows through really well! I'm new to fountain pens, so I don't have a favorite yet. But I do love the uni ball signo blue/black. I just picked up some cartridges of Pilot Namiki blue black for my new Pilot Metropolitan. This would be a great addition to my budding collection. Great ink! Great review! - Joel A. My standard blue-blacks are Noodlers 54th Massachusetts and Rohrer & Klingner Salix. I have been waiting to see Aurora's and like that it has a pretty dark, but not totally dark, look. Thanks for such a thorough look at it. 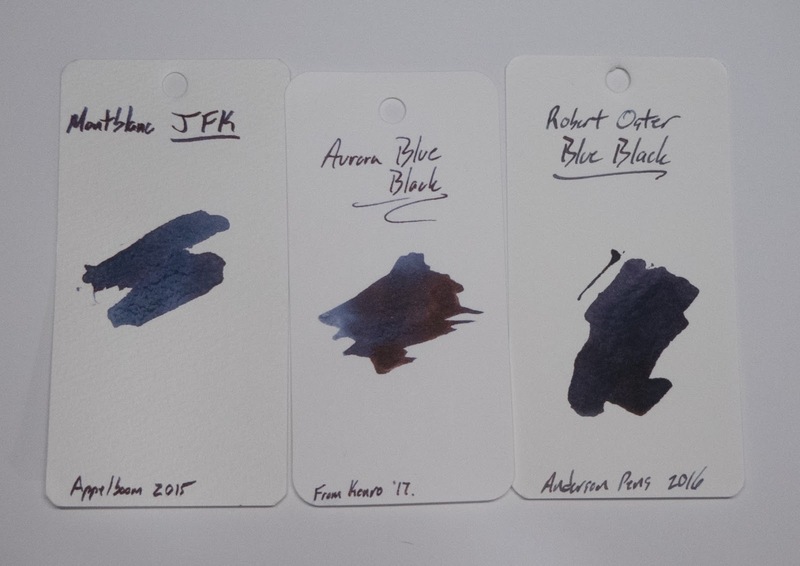 My favorite blue-black is Pilot Blue-Black. I'm keen to try this Aurora Blue-Black to see how it compares. I'm a fan of Namiki/Pilot Blue-Black, Sailor Jentle Blue-Black, Sheaffer Skrip Blue Black (my first bottle of ink ever! ), and Blackstone Sydney Harbour Blue. My favorite right now is Noodler's Navy - a surprisingly straightforward but dark blue black. I used up my sample super fast! 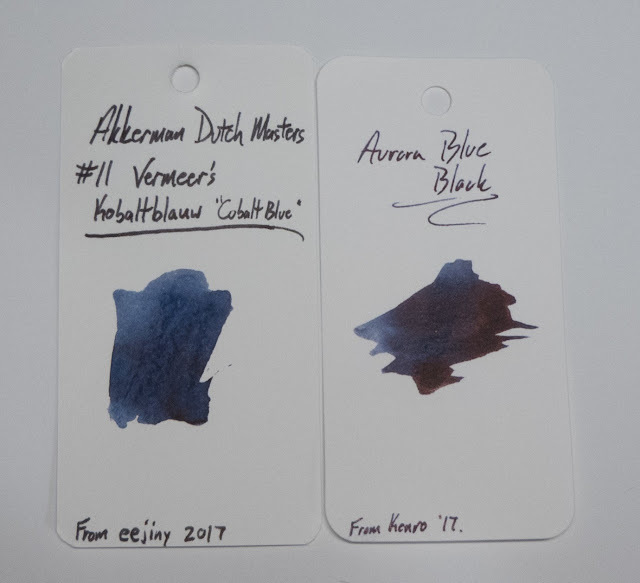 I agree with you, the color is beautiful, have you had a chance to compare it to Diamine's Blue-Black? I'm fairly new to fp's so this would actually be my first blue black that I try, but the color seems pretty. Not sure if you convinced me to buy a bottle of this or Chu Shu, it may have to be both! Sorry to hear this ink runs dry... i just love the color! My favorite ink these days is Iroshizuki Kon Peki. Nice ink! Need to try it. 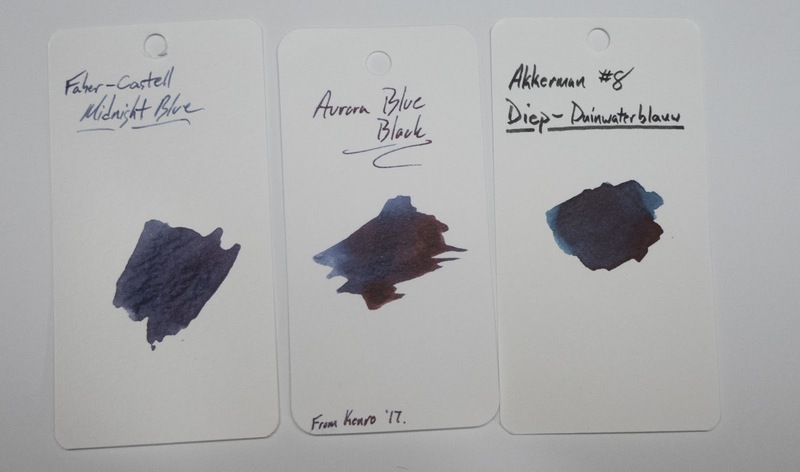 Previously I've not been into blue black inks, but lately I've started to have more of an interest. This one looks good, I would love to win. Thanks for the giveaway! I actually don't own a single blue-black ink yet. I got to try this out at the Baltimore Washington Pen show and fell in love with it. Sadly I had already spent my pen show budget by the time I got there so I wasn't able to get any :( Fingers crossed that I will win this one! My favorite blue black is 4B. Depending on the day, my favorite blue-black is Rohrer & Klingner Salix, Noodler's 54th Massachusetts, or Waterman Mysterious Blue. My favorite so far is Sheaffer Skrip blue black. Really love bungbox 4B but also Califolio Bosphore is a lovely shader! This isn't a true blue-black, but I really love Rohrer & Klingner Verdigris. I love Akkerman #10! Favorite ink. Montblanc JFK is my favorite blue black ink. My favorite Blue-Black is Pelikan Edelstein Tanzanite. Thanks for the giveaway. I was wondering how well it cleans out of your pen? 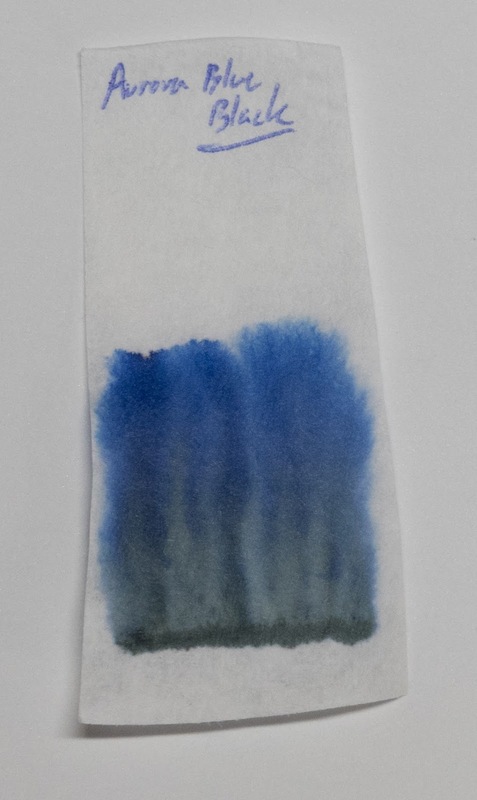 The amount of blue that shows does vary by nib, and drier nibs will look more blue while wetter ones will be more blackish. Nope. I haven't compared it to Diamine Blue Black. I don't think I've ever used that one. How well does it clean out? 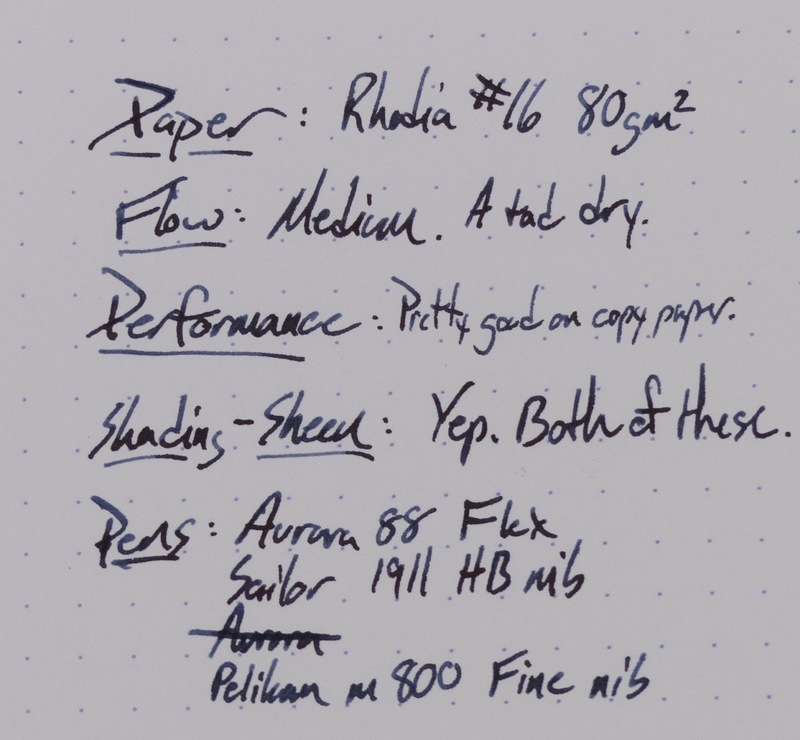 Well, I've only taken it out of one pen (the Aurora 88 flex) and it cleaned out ver easily. No problems that I could discern. Pilot Blue-Black is undoubtedly my favorite in terms of most-used -- it was the first bottle of ink I ever bought, and if I remember correctly, it was thanks to your review! 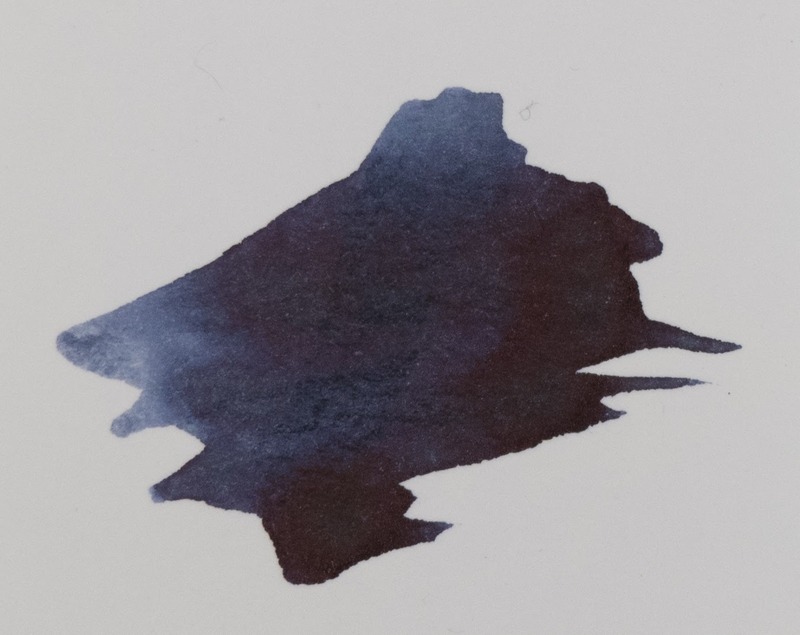 I also have a soft spot in my heart for the first ink I ever used, which was the Ecclesiastical Stationery Supplies Registrar's Ink, a hard-core iron gall blue black that unfortunately gunked up my pen for a bit.. nice color though, and amazing performance on crappy paper. Thanks for the reviews, past, present, and future! Very nice blue black, looks like I need to pick up a sample! I haven't used a blue black yet. 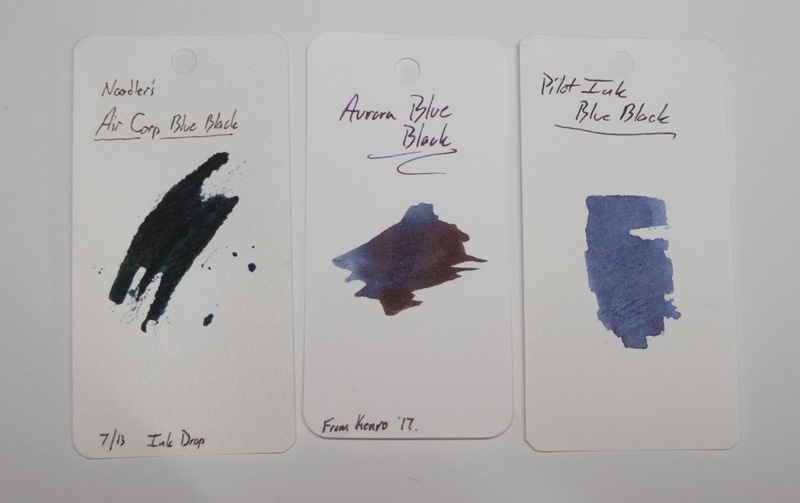 I use plenty of blue - Pilot Kon-peki or Aurora Blue - and I use some black - Lamy Black - but never a blue black. I really like the look of this Blue-Black. I'm currently using the Parker Quink Blue-Black, which I like, but is way more on the blue/teal side. Noodler's 54th Mass is also in the rotation. Thank you for the opportunity! My go-to BB are from pilot and Lamy and the Bung Box 4B. I've tried Salix and 54th Mass and neither are my thing... Aurora BB looks so intriguing!! 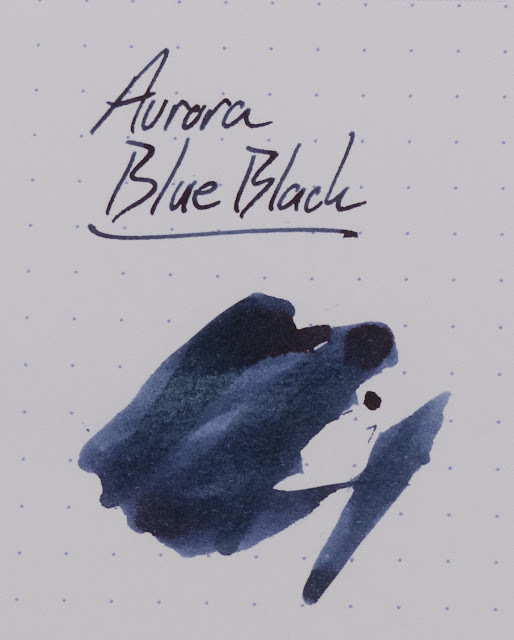 I've used Aurora Black in my Aurora Idea for a few months now and I have to say its a nice black ink. 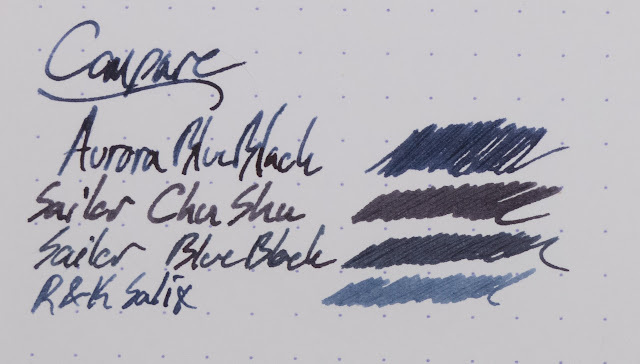 Was thinking 'bout trying Graf Von Faber Castell Midnight Blue may hold off for a bit. Any-who thanks for all the work and effort you pour into these most excellent reviews! I've never used a blueblack that i liked. I used to have a bottle of Bad Belted Kingfisher that was so dry. awesome ink! would love to try it! 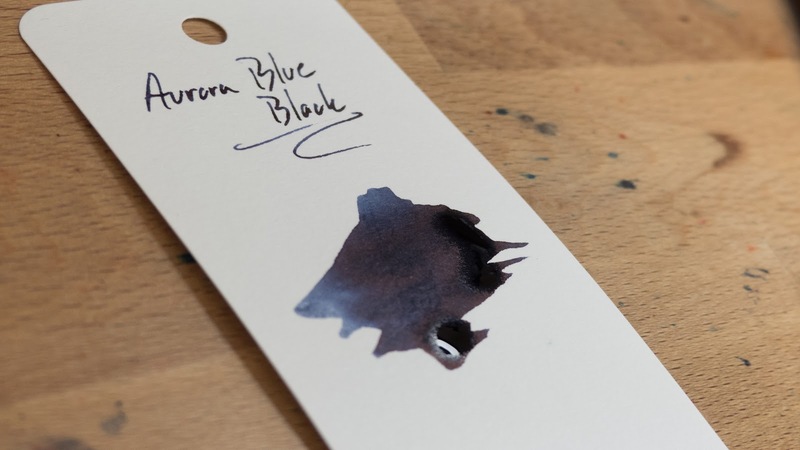 Aurora Blue Black is the one I'd love to try. Great review! Would go great with my Ipsilon! Very nice review. It's good to know it's a drier ink. 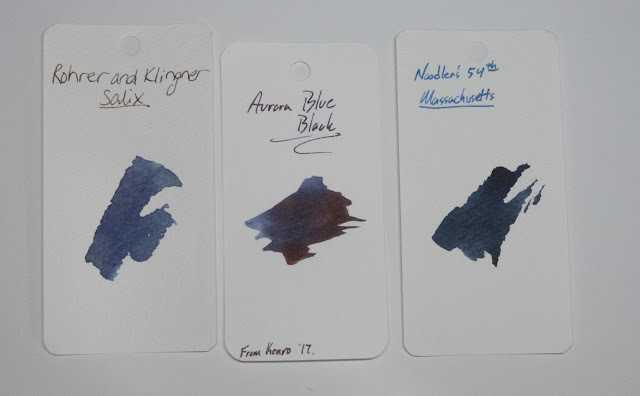 Just started venturing into blue-black inks- right now my favorite is Shin Kai. Looking forwards to trying this one! One more Blue Black for the collection! 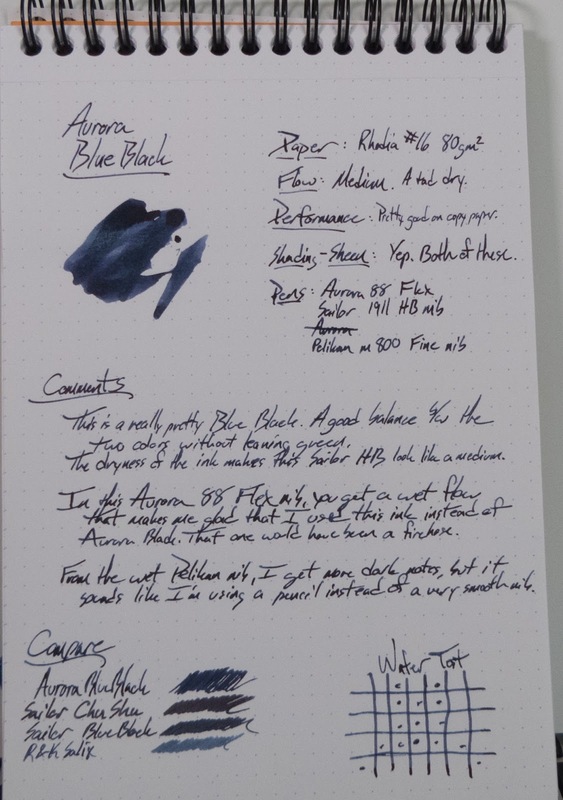 I've been a huge fan of Parker Quink Blue-Black and Noodler's Blue-Black for a while, but after trying Aurora Blue-Black at the Arkansas Pen Show, I think I have a new favorite. That's for the review! Ohh, I'm looking for a drier ink. :D I really <3 Private Reserve Ebony Blue. Thanks for the review. I don't have a favorite. I am trying to decide which blue-black ink would make the best faux oak gall ink. You should claim yourself on bloglovin.com because that's where I follow your blog (and then I could have another entry). That looks like a really nice blue black ink. Thanks for the review. Currently R&K Salix, but this ink intrigues me. Aurora Black is fantastic and this appears to be a much darker shade of blue-black than Salix.